There is no magic cure or pill that will guarantee you the hair you have always wanted but for those of us with fine, thin hair or who are experiencing hair loss, there is a product that will give you the appearance of full thick hair as soon as you use it. The product in question? Toppik Hair Building Fibers. These Fibers are available in 9 shades and 3 different sizes and will give you the thicker, fuller head of hair you’ve always dreamed of. No more days of stressing about your hair thinning or trying to save money for surgery. Toppik is the answer to your hair loss and hair thinning problems. If you have never heard of Toppik Hair Building fibers, continue to read and learn how Toppik works by bonding naturally to your own natural hair, the advantages of this and even the additional benefits that you would never of thought could come in such a product! Toppik Hair Building Fibers are made from Keratin Fibers which are coloured, natural fibers that have a static charge that binds them to your own hair. These Keratin Fibers are made from the highest grade of keratin and provide a similar type of protein that your natural hair provides. The quality of our Keratin Fibers are the reason why Toppik Hair Building Fibers blend undetectably into your own natural head of hair. 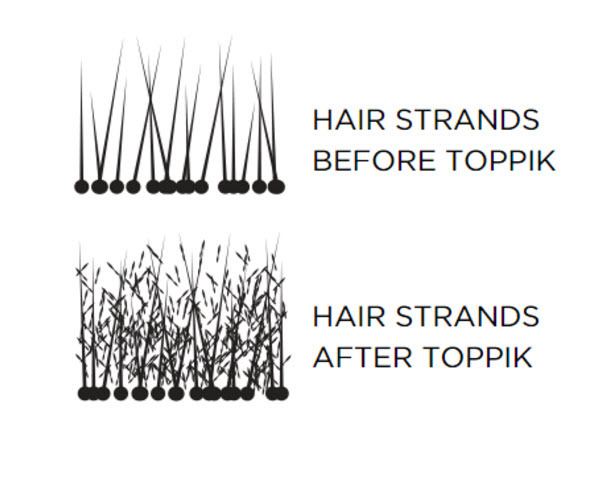 How Do Toppik Hair Building Fibers Work? Once you have washed, dried and styled your hair as you like it, all you have to do it simply shake or spray the Toppik Hair Building Fibers onto your hair and watch as it transforms your thinning hair into a thicker, fuller head of hair. Due to the static charge in the keratin fibres, Toppik will cling to your natural hair and won’t fade away unless you wash it. Below is what the keratin fibres will do once they have been added to your hair. As you can see, the Hair Building Fibers intertwine with your existing hair for a completely natural look. Anyone who wants a cosmetic solution for fine, thin or thinning hair with any hair colour or type can use Toppik Hair Building Fibers! If you have an uneven hairline, patchy scalp spots or just thining hair, Toppik is sure to be your new secret hair-loss fighting weapon. If you can’t decide how to use the Hair Building Fibers, check out the video below that has a great example of someone who doesn’t quite have thinning hair but has found the great benefits of using Toppik Products! Toppik Hair Building Fibers will stick to your natural hair until you wash them out so are perfect for anyone who doesn’t have to style or wash their hair every day! Toppik helps to create a flawless finish and a thick, full head of hair. There are other ways to apply our Hair Fibers so check out the video below! Q. What happens to Hair Building Fibers in the rain? A. Hair Building Fibers will stay firmly in place even in wind, rain, and perspiration. Q. How do I get Hair Building Fibers to stay in place? A. Hair Building Fibers will stay in place naturally because of the static charge between the Fibers and your hair. Pat or spray Hair Building Fibers into your hair and you are ready to go! For even longer-lasting results and added shine, use Toppik FiberHold Spray. Q. Do Hair Building Fibers affect hair growth? A. Hair Fibers do not encourage or discourage hair growth. The natural keratin fibres will not clog pores or affect scalp condition. Q. Can I use other styling products and tools with the Hair Fibers? A. It is recommended that Hair Fibers be applied after the use of any styling tools such as hair dryers, flat irons, or curling irons. Styling products (other than hairspray) should be applied to the hair prior to applying Hair Fibers. Applying gels, mousses, pastes, serums, and the like after applying Hair Fibers may cause shifting with the Hair Fibers and could expose the areas that were meant to be covered. Let styling products dry before applying Hair Building Fibers. A. Toppik Hair Building Fibers work with all hair colours and hair types, including ethnic hair. Q. How do I match my hair colour? A. Matching your hair colour is easy with our hair colour swatches! Simply select the hair colour swatch that is closest to your hair colour. You can also mix and match different shades together to get your own true colour. Q. How long will a bottle of Hair Fibers last?